Way back when, I posted on Facebook that I had Molly Wizenberg’s Roasted Eggplant Ratatouille. I’ve never been a big fan of ratatouille, so it was surprising to me that I found it to be ok, which is a huge step for me. What I discovered is that I don’t like my veggies in a sauce and mushy. The eggplant surprisingly enough stood out because it had been roasted well. I thought I’d give the whole concept a try and roast all the vegetables, cool then mix them together. Lo and behold, that was the ticket to success. I’m not sure if it would be called ratatouille anymore, but I’m sticking with it. I like to roast the ‘like’ vegetables together. Meaning, the vegetables with the highest water content on one baking sheet and the ones with the lowest on another. You can also opt to roast vegetables sliced rather large and then dice after they’ve roasted and cooled. I’ve done it both ways and have found I like to dice mine before they hit the oven because, as I stated earlier, I like a dryer ratatouille. 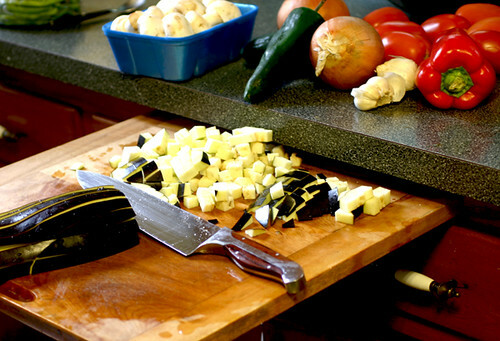 The key to roasting vegetables is to lay them on a large, lipped sheet pan in one layer without over-crowding. You want your veggies to roast, not steam. Likewise you don’t want to cram your oven full of sheet pans, two at a time will do. All the sets of vegetables below each took a ‘turn’ in the oven, on their own until each were nicely browned. It’s also optional to toss them with a little olive oil before laying them on the sheet pan. Do Kosher Salt and Fresh Pepper them. Do mix in a seasoning (fresh or dried basil or oregano or thyme or marjoram or some combination of these) once they’ve all been combined. If at all possible let the whole kit and kaboodle sit in the fridge over night for the flavors to meld. 10-12 Roma Tomatoes these work best sliced in half to roast, then cool and diced later. Looks GREAT!!! I think I’d like it either hot or cold. I’m with you on mushy veggie, especially eggplant. The mushiness ruins this otherwise delicious veggie. Will be trying your roasted version, thanks. Mmmm, going to have to try it this way. Roasted veggies = so much flavor. Mushy veggies = bleh. Great photos, Mary! Deeeeelicious and healthy. Are you getting “back on track”? Yep! Back on Track to PUSH THE BISCUIT BACK! John says sneak a snack in the second part. HA! Your ratatouille looks wonderful. I do like eggplant, but only when roasted properly like you have done here. This sounds like a wonderful dish; thanks for the recipe! This is on my top 5 fave list! 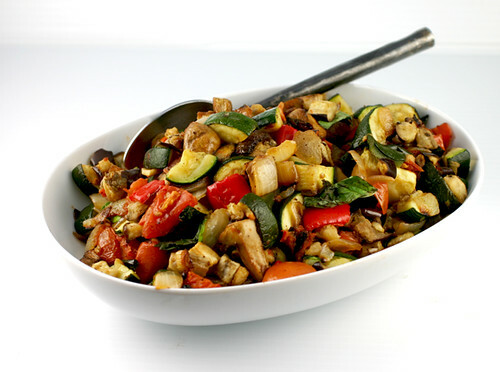 I love ratatouille and I make it as often as possible … this is a great recipe! Thank you for sharing! We must be similar in taste. The only ratatouille I’ve ever been able to eat was a recipe I found where it was grilled. Changes the flavor and consistency completely, making it much more palatable. This looks the same; beautiful and very, very good. Thanks! Looks great, and I appreciate how simple and pure the flavors are. Not only does your ratatouille look great but your photos are so wonderfully vibrant. Looks inviting and delicious- I love this dish! I DO like stewy ratatouille, but recently experimented with roasting everything before stewing it just briefly and found it to much easier. And I very much agree that it’s better the next day! OMG I heart ratatouille! These roasted vegetables sound super amazing! Fabulous dish! This must taste incredible!!! I just had roasted ratatouille this weekend and it was so outstanding! This recipe looks really good too, I love the veggies in this dish. Makes it so hearty and delicious! I don’t like the mushiness of ratatouille either, but I will be trying this roasted version!